Who else but a clown would drink alcoholic drinks that pickles their liver and numbs their brain? Who else but a clown would smoke tobacco that induces emphysema and lung cancer? 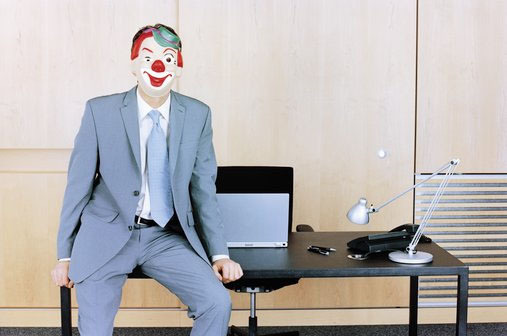 Who else but a clown would gamble away all their money in casinos or the stock market? Who else but a clown would allow their bodies to inflate by obesity from gluttony and overeating? Who else but a clown would amass negative thoughts that bring on depression and worry that are then supposedly remedied by suicidal drugs? Who else but a clown would argue with other clowns about who is correct in analytical economic scientific, religious or financial disciplines? Who else but a clown could cleverly manipulate oil prices and other essential commodities to extreme highs that can play havoc world economies? Who else but a clown could appear in the media giving ill-founded advice, continually getting it wrong, and still call themselves experts? Who else but clown could invent an education system that teaches clever people an education that allows them to apply it erroneously, in various diverse business fields, to deceive innocent people and think they can get away with it ... unfortunately, numerous clowns do get way with it and are rewarded with a considerable payout. Who else but a clown could formulate mortgaged backed collateralized notes, swaps and derivatives that can bring about the near collapse of world financial systems? Who else but a clown could conceive a clowning God that kills new born babies, helps wage wars for no reason and is jealous and angry if you don't go for ‘his’ intellectual festering nonsense? Who else but a clown would remark the universe happened by chance with no intelligent mastermind orchestrating the advancements and then invents weapons of mass destruction to keep the peace? Who else but a clown would mingle with other clowns, gossip, and badmouth other natural living folks who don't fit into their perverted sociable clique? Who else but a clown can juggle balls and wear a red nose ... Ah! The last clown you will recognize from the circus but the other clowns you may not associate with yourself or lifestyle at this moment, however you may initiate new thoughts that may change your thinking somewhat. So how did these clowns get so much power that they control almost every section of humanity? Perhaps it all started when humans began to realize they have a thinking brain that can use logic and reasoning to work things to gain power and manipulate the social order. Once certain rules and regulation were set in place that seem reasonable for a civilization to live by they started to become more sophisticated and the simple pleasures of just being alive and enjoying earths beauty was not enough. They wanted more because their minds became restless and life seemed boring. After all, why buy a Ferrari if you can't open it up and speed at 150 mph. With the onset of new inventions and discoveries came the synthetic sophistication of the human brain. Over thousands of years, the brain locked itself into a clownish, orchestrated mindset that only a devilish clown could conduct. It changed natural, simple living and integrated synthetic symphonies of mistaken cleverness into today's normal living standards. What mental tool did humans use to make this happen? Well, they turned around their own inborn intelligence and made it into a slave of the major grease painted clown called ego/intellect. Religion recognizes it by an illusionary fallen angel called -- the devil, which for them is real and to blame for all the disorderliness of egotistical humanity. However, even the mythical devil can only function when it has full control of the clowns on parade in the brain of all humans. Yes, you got it right at last; the real culprit is the human grease painted ego's; mistaken Perspectives, obnoxious Ideas, misguided Thoughts and immoral Suggestions, (now to be known as … Living in the PITS) … It is the PITS that is responsible for all the outer and inner turmoil in everyone's daily toil. The grease-painted ego, the red-nosed personality and the flat-footed intellect of a human being, clowns around the outer playground of insincerity. However, in reality the human being can play out two very different distinct functions. One is to live with inborn intelligence and allow it to shine its light to guide the trustworthy paths to be taken. When this true way of living takes center stage, in the inner playground of love, joy and good intent, the results are good for everyone. People help each other to live a joyful loving life. Hero's are found rescuing and recovering people in distress. Great creative works are composed in the arts and academia. Breakthroughs in science bring about the eradication of disease. The world is in peace and harmony and pollution is an outdated concern. Regrettably, there have been very few occasions where love and harmony existed throughout the entire modern world. Alas, the true identify of human beings is kept a mystery by clever bogus clowns in powerful places, which gives rise to ignorance and unawareness of authentic identities. This lack of authentic wisdom is the cause of great grief, mayhem, confusion and uncertainty. The clownish ego has gained the power to use its own synthetic textbook knowledge to guide its intelligence into many types of hell and damnation on earth. When a person continues to take themselves seriously while falling in the same holes time after time, then that seriousness, which is the shallowness way any human can live, will lead the to chaos and mayhem throughout their erroneous lives. Therefore, with this in mind, what is the remedy to control the invalid clowns, strike them out of the big top mind and let them repose in a recess nook that controls their performance? When a person voluntary stops their clownish behavior for while and looks back at all the mistakes and can laugh at themselves to enjoy the humorous tomfoolery, they can start to stop the erroneousness and start to live naturally. Just by letting go of your daily routine and looking back at yourself as a clown with a red nose and funny face will allow you to break the mold and change the clowning around into a more meaningful, joy-filled life. When you can laugh at yourself first and foremost you can then begin to laugh at all the other clowns who are acting out serious, pointless roles. When you view the people who antagonize you or wind you up as clowns with funny faces, you can laugh at them and start to enjoy their antics. You can be assured they will stop the annoyance very quickly and look for someone else less aware to pick on, because you are enjoying their antics and that is not their intent. One final point you must understand, you will always have clowns in your mind wanting to enact their foolishness ... However, just as long as you identify them before they can do any lasting harm you can take away their power with the vitality of your inherent intelligence. Wow, just think if everyone went around laughing and joking at the serious clowns what a wonderful world this would become. Hey you! … Coco playing with investments! … That tightrope you're about to walk may not have a safety net to catch you this time around?